Living a Fit and Full Life: The Republic of Tea Organic Assam Breakfast Black Tea Makes My Mornings Great! The Republic of Tea Organic Assam Breakfast Black Tea Makes My Mornings Great! Founded in 1992, The Republic of Tea sparked a Tea Revolution. We began by canvassing the most prized tea gardens of the world for their worthiest leaves. Our mission was—and is—to see these teas steaming in the cups of men, women and children everywhere, and to emphasize a Sip by Sip Rather Than Gulp by Gulp lifestyle. In keeping with our identity as an independent republic, we designate our employees Ministers, our sales representatives as Ambassadors, our customers as Citizens and retail outlets as Embassies. With supreme good fortune, we have progressed—constantly enriching people’s lives through the experience of premium teas, education and innovation. Our award-winning packaging includes teas and herbs available in specially designed air-tight, light-resistant tins containing either full-leaf teas and herbs or our signature round, unbleached tea bags, free of unnecessary envelopes, strings, tags or staples. Decaffeinated teas (using a natural CO2 method) varieties are also available. Most of our teas are Certified Gluten-Free by the Gluten-Free Certification Organization (GFCO). Steam billows, the teapot fragrant. I enter a state of desires diminishing. Within the stillness, a further pleasure. Nothing coarse or superficial. This is drinking tea. A socially and environmentally responsible business, The Republic of Tea is dedicated to sharing our prosperity by developing products to support worthy organizations, including the Prostate Cancer Foundation, Action Against Hunger and the Whole Planet Foundation. We are also a member of The Ethical Tea Partnership. The Republic of Tea offers more than 300 premium teas, herbs, bottled iced teas and nature-inspired sipware. Our Citizens are invited to discover our offerings in natural and specialty gourmet retailers, restaurants, online or by calling 1-800-298-4TEA (4832). Back In The Body Tea - The robust, malty character of this tea comes from pure, unblended Assam leaves grown in Northern India. Plentiful golden tips on leaves & hearty body qualify this tea at the top of its class. Certified Assam tea by the Tea Board of India. Black Tea has less than half the amount of caffeine per cup than in a similar-sized cup of coffee. The Republic of Tea Organic Assam Breakfast Black Tea is wonderful! I love the fresh full flavor of this tea. 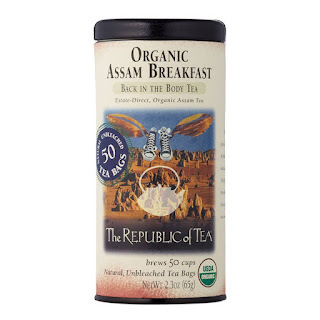 The Republic of Tea Organic Assam Breakfast Black Tea is the perfect way to start my morning. I've been waking up early before the kids and watching the sun rise while sipping this tea and I can honestly say it's put me in a great mood every morning. Just having those few moments of quiet when the house isn't stirring to sip a tea like this and just focus on each sip, breathe and take in the beauty of the morning has totally changed me. I also have to add that getting that little boost of caffeine before the kids are up is awesome! I absolutely love the flavor of this tea and how cute the little bags are. The Republic of Tea Organic Assam Breakfast Black Tea comes in a cute tin and would also make a wonderful gift for anyone who loves tea. 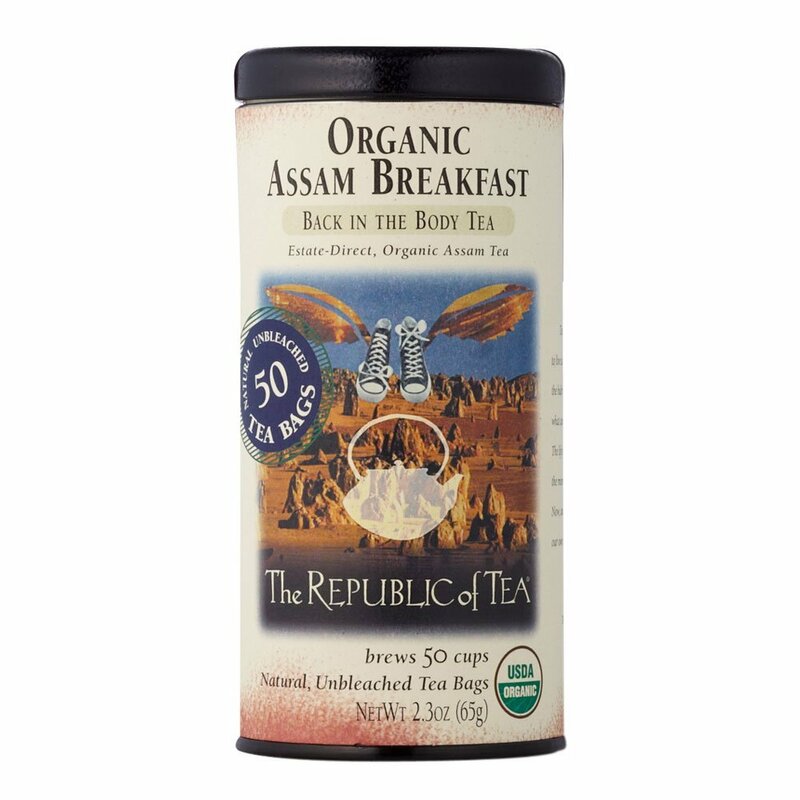 I highly recommend The Republic of Tea Organic Assam Breakfast Black Tea! Click HERE to learn more about The Republic of Tea! Follow The Republic of Tea on social media!